Creative writers trying to wrestle their way out of a block sometimes use a simple exercise to summon the muse: They open a dictionary, pick three random words, and write a scene or a character monologue that includes those words. The specificity of the three words pulls a writer’s head out of the fog and provides some small, achievable goals to work toward. Word Up: Find a novel way to say just about anything with Word Twiddle. Inspiration from random stimuli isn’t exclusive to writing. It can be an effective technique to get a brainstorm brewing for all types of creative activities, from naming your new company to mocking your friends. 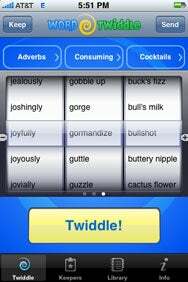 With Word Twiddle from Double Dog Studios on your iPhone or iPod touch, you can generate arbitrary combinations of words to kick-start a stalled imagination. Using a slot-machine-like interface, Word Twiddle works quickly to pluck up to three terms from its database of 50,000 words at the tap of a button. (The free lite version of Word Twiddle offers a library of 3,700 words.) It successfully combines simplicity with a high degree of customization. You can choose basic categories, like nouns, verbs, adjectives, or adverbs; you can also narrow your choices by using more than 50 pre-defined subcategories, such as action verbs, colors, foods, business buzzwords, dog and cat names, and many more. Double Dog Studios even gives us some insight into its target market (or perhaps its company parties) by including subcategories for cocktails, drunkenness, vomiting, and flatulence. 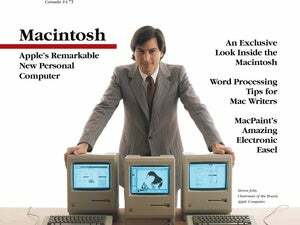 Any words that you find particularly inspiring can be saved to a list of “Keepers.” You can also tap the “Send” button, and Word Twiddle launches Mail, dropping the terms into a new message. You may still need a dictionary, because Word Twiddle sometimes spits out some pretty obscure terminology. Or you can just keep tapping until you see some words you recognize. Eventually, you’ll find the elusive phrase that sets your creativity in motion. Word Twiddle is compatible with any iPhone or iPod touch running iPhone 2.1 software.